I know this one has been making the rounds, but I just had to post it here as well. As ORLY continues to pioneer the nail category with distinct and trend setting finishes and color, the brand introduces its latest addition to its portfolio of textured finishes with Cosmic FX. The new, limited-edition collection delivers multi-dimensional flashes of intense shimmering shine that is so electrifying your nails will explode with color! 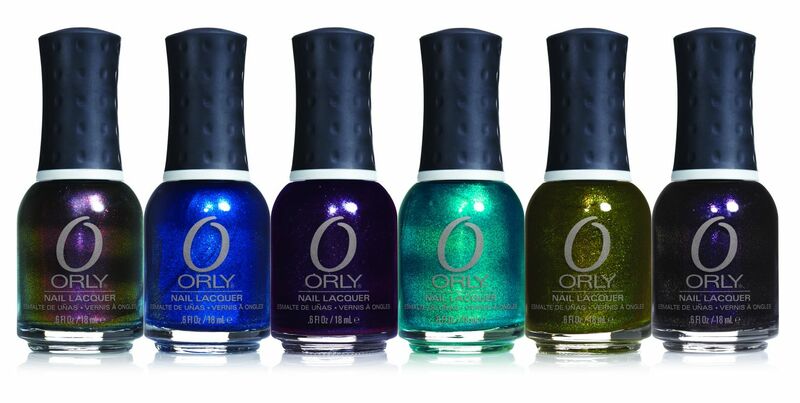 This lighting phenomenon is achieved by ORLY’s exclusive MINERAL FX technology. The MINERALFX technology includes specialty mica, that allows for a clearer, vibrantly bright lustrous shimmer. Crystals allow for a multi-dimensional color transformation. Glass particles carefully controlled in shape and size create a luminous phenomenon. This combination infused with the Silica and specific colors selected create this exclusive technology that gives nails a unique optical effect that’s magnified as the lighting source intensifies or viewing angle changes. Cosmic FX perfectly accentuates the looks seen in the Fall 2010 runway collections – from the futuristic Audrey Hepburn at Miu Miu to Ann Demeulemeester’s feathered and metal cuffs and Issey Miyake’s colorful leggings. Apply two coats of the Nail Lacquer to achieve the ultimate in color. All ORLY Nail Lacquers including the Cosmic FX Collection are free of DBP, Toluene and all traces of Formaldehyde and Formaldehyde Resin. The Cosmic FX Lacquers will be available starting September 2010 for $10.00 each. ORLY Nail Lacquers and Treatment products are available at orlybeauty.com, Sally Beauty, Ulta and other purveyors of beauty throughout the U.S. and in over 70 countries worldwide. Okay, Holy Smokes does this look like an amazing collection or what? 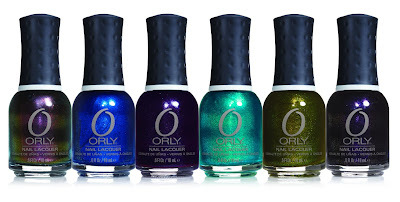 I loved Orly's Foil FX collection, so I can't wait to see this one. I'm thinking I need them all (of course, I thought that from the first moment I saw it. LOL). I will never get tired of seeing this press release! Ahhh I just can't wait until they're actually out!